I just checked the calender and the announced date for building plans, 23 February, is a Saturday?? The Natars will begin to build WW the 20th Mars. That usually don’t happens, the server will have ended by then. Uollas is impatiently waiting for the response from Union but they are still concentrating on clearing their neighbourhood except from individual players sending ghost hammers searching for unguarded hammers in oases in NorthWest. 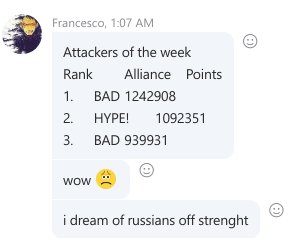 BAD is hunting UNI which such an intensity that 9 of the german players went into vacation to get a rest ^^ Hype is the big bad wolf and a real nightmare for the polish ally nPL whose area is fast diminishing. I asked orion981 who holds a WW for SPQR™ a few questions. I think he misunderstood #3 but I haven’t been able to get a clarification yet.